Erasing your iPhone or iPad and resetting it to factory settings is a good way to fix issues, and vital if you want to sell it or pass it on. 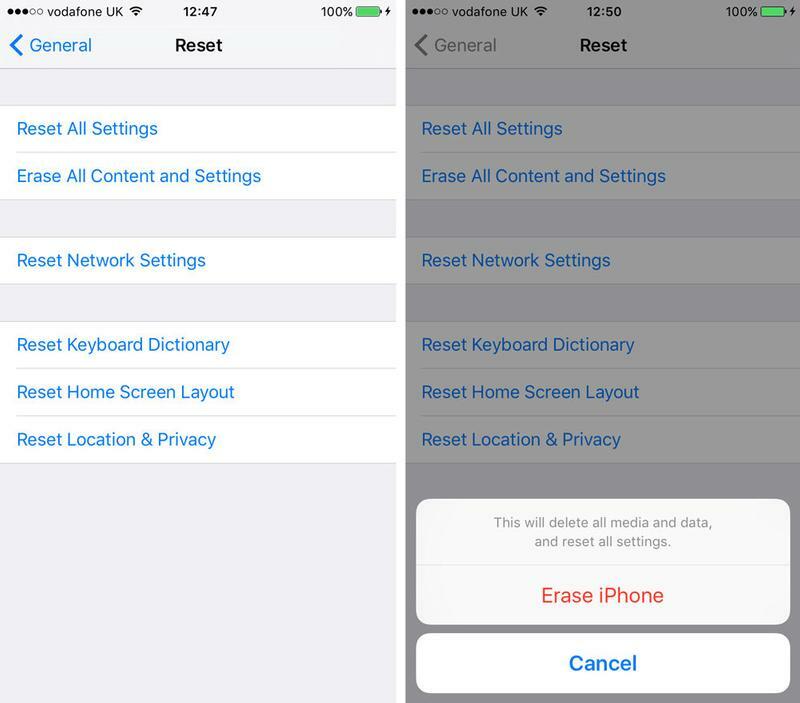 How to factory reset an iPhone or iPad In this tutorial we show you how to reset an iPhone or iPad to factory settings, which is essential if you need to wipe the data from a device because you’re selling it, or passing it on to a family member or friend. When selling an iPhone or iPad, it’s absolutely vital that you delete all the sensitive data stored on it. If not, an unscrupulous buyer could gain access to your social media profiles, your financial information and even your personal photos and videos, enabling them to browse through your private moments or steal your identity. A factory reset can also help resolve issues with your iPhone or iPad if it’s crashing or freezing, or suffering from problems you can’t identify. Modern electronic devices can be very complicated, and can get themselves into a bit of a confused state from time to time. Resetting and wiping a device can clear out problems that cause the device to get stuck in a loop, appear sluggish or otherwise impair performance. It’s not a guarantee, but you’d be surprised how often it works. For a less drastic solution to undiagnosed problems, you should first try restarting or force-restarting your iDevice. Before you wipe your device make sure that important information is backed up. To use iTunes to back up your iPhone or iPad, you’ll need to plug your device into your PC or Mac using the charging cable. Click on the iPhone or iPad icon in the top left corner of iTunes, under the Play button. Once you’re confident that you’ve backed up your iPad or iPhone, you’re ready to perform a factory-reset. This will completely wipe your device, which is why having a backup beforehand is so important. After typing in your passcode if you’ve set one, you’ll get a warning box appear, with the option to Erase iPhone (or iPad) in red. Tap this. That’s the quick method, but if you just want to free up some space on your iPhone a full wipe isn’t necessarily the best option. Next we’ll look at a quick way to free up some space. 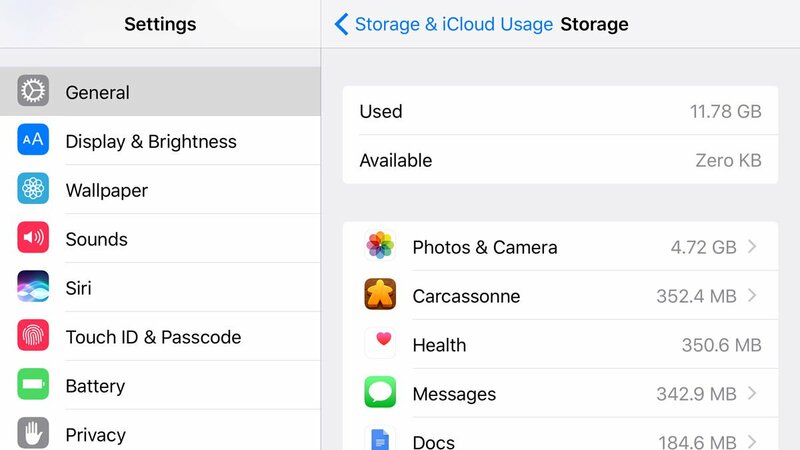 To identify the biggest culprits taking up your storage space, go to Settings > General > Storage & iCloud Usage. iOS will tell you firstly how much space you’re using and how much is available, and will then list the apps taking up the most space. Remember that these listings include associated documents and files as well as the app itself, so Photos and Music are likely to be up near the top. Instead of deleting the app (which you wouldn’t be able to do anyway, with Apple’s preinstalled apps) you could go into the app in question and clear out some old photos or songs, for example. If you’re worried that your iPhone or iPad wasn’t backed up, don’t despair: there’s a good chance that there’s a backup you’re unaware of. To find out if you’re backing up to iCloud (you get free 5GB of space) go to Settings > iCloud and tap on Storage. Wait a few seconds for Manage Storage to show up and tap on that. Here you will see your various backups for your iOS devices (there might even be one for an old iPhone that you could delete if you need more space). One of the backups should say that it is This iPhone or This iPad. Tap on that and you can see what is, and isn’t being backed up. You can basically turn things on and off so that they don’t take up your full 5GB, or you can pay a few pounds a month for more storage. You may think that some of those apps don’t need to be backed up, after all, you will be able to download them again from the App Store as you already own them. But note that the data may include saved data for games, and other settings and preferences that you would prefer not to lose. 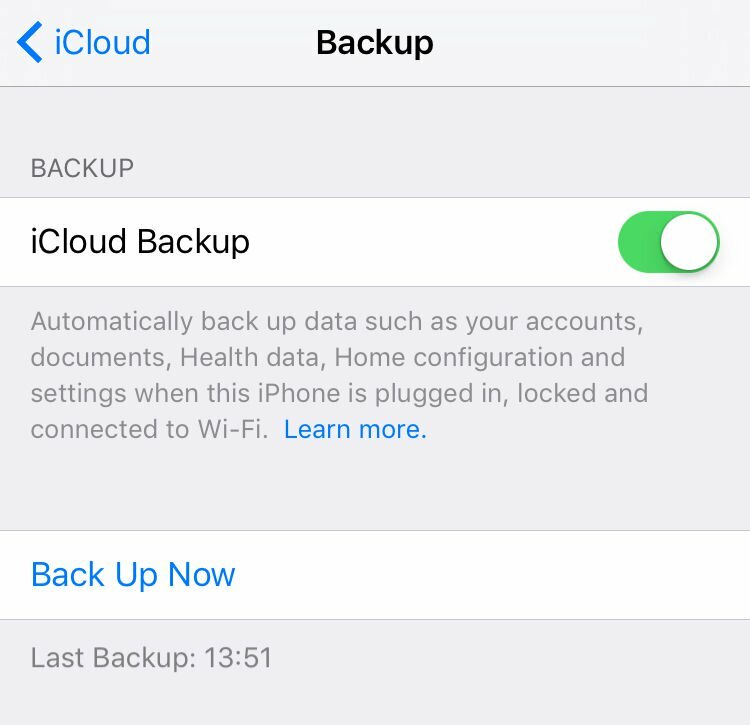 If you find that you aren’t backing up this way, we recommend that you go to Settings > iCloud > Back up and turn iCloud Backup On as this is the simplest way to back up and means that you always recover the data on your phone no matter where you are, all you will need is a connection to the web. On the other hand, if you can’t find a backup, it’s likely that you won’t be able to retrieve data once you have deleted it. The data on an iOS device is automatically encrypted, and wiping the device destroys the encryption key, making it more or less impossible to get anything back when it’s been fully erased and reset without access to a backup. In an emergency you could try speaking to someone at an Apple Genius Bar, but it’s a long shot to say the least. (This applies to a full erase/reset, mind you – in other circumstances, such as data corruption, a malfunctioning device and so on, the experts may be able to help.) This also reinforces out frequent advice to back up regularly. Start up the iPhone and enter your details when prompted, including WiFi password, until you reach the page where you’re asked how you want to ‘Set Up iPhone’. You now have three options: Set Up as a New iPhone, Restore from iCloud Backup or Restore from iTunes backup – so select the iCloud option and you’ll be prompted to enter your iCloud account details. Once you’ve done this, and agreed to the terms and conditions, your iPhone will begin restoring all of your data. Obviously this could take a while if you have large backups or a slow internet connection, so don’t attempt this if you’re in a hurry. When the backup is completed your iPhone will reboot, and then it will start the larger job of downloading all of your apps. As with the iCloud instructions we’ve already outlined, follow the steps up to the ‘Set Up iPhone’ screen, then select Restore from iTunes. You’ll be prompted to Connect to iTunes, so plug in your iPhone and you’ll see a screen on iTunes that gives you the option to restore a backup. Click continue and your iPhone will be set up automatically, with the apps being restored from the iTunes backup. When it’s finished, you’ll have a freshly cleaned system. Hopefully any problems that you were encountering before will be a thing of the past.